Long pleated skirt with multicolor print. 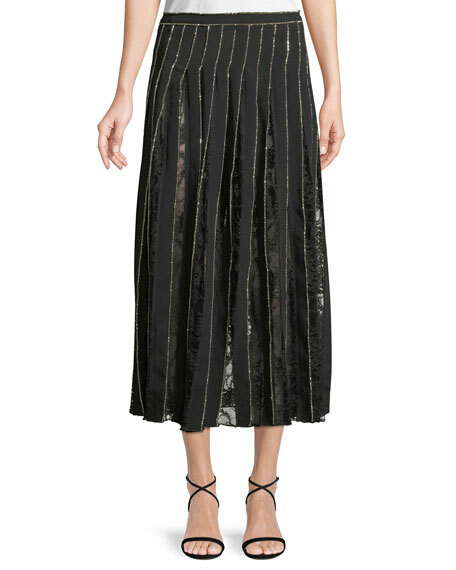 Schiaparelli maxi skirt in chevron print silk georgette. 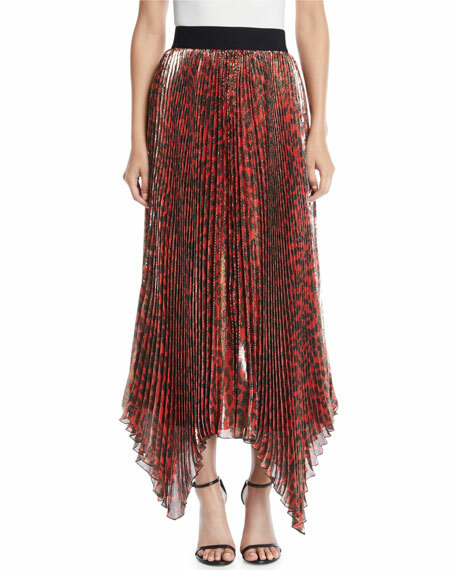 Adam Lippes silk crepe skirt with crystal-embroidery and lace insets. Natural rise. Pleated silhouette. Hidden back zip. Midi length. Made in USA of imported materials. Akris punto striped-knit pleated skirt. Approx. 23.5"L from waist to hem. Natural rise; hidden back zip. A-line silhouette. Knee-length. Viscose/polyester. Imported of Italian materials. La Petite Robe di Chiara Boni "Ebby" ruched coverup skirt. Formfitting. Mini length. Pull-on style. Nylon/spandex. Made in Italy.